Graduation ceremonies tend to be predictable rites of passage for students the world over. But in Hong Kong, students at the Academy for Performing Arts have turned an otherwise staid event into potent political theatre. Dressed in black caps and purple gowns, about a quarter of the graduating students - who study music, dance, drama, film and television - took the opportunity last week to send a clear message of discontent to Leung Chun-ying, Hong Kong's top leader, who was on stage officiating. One student showed him her middle finger. Another got down on her knees asking him to resign. Yet another graduate bent over to show Mr Leung his backside, though he did keep his trousers on. A group of students then held up placards spelling out demands for universal suffrage, which has been promised but not granted to the seven million residents of this former British colony. Tam Lok Hang, 22, did not join the group protest, but he gave Mr Leung a thumbs-down sign to loud applause when he walked onstage. He told BBC News he had shouted: "689 step down! I want universal suffrage." '689' has become a pejorative nickname for the chief executive, who is commonly known as CY. It refers to the number of votes Mr Leung received last year from an elite committee of electors largely loyal to Beijing. That he was elected by a small group, and not by eligible Hong Kong voters, has angered many residents, tens of thousands of whom took to the streets earlier this week on the 16th anniversary of the city's handover to China. They marched for hours in the rain to protest against Mr Leung's government and the lack of direct voting rights here. The most commonly heard refrain was: "CY step down!" The size of the pro-democracy, anti-CY rally, which drew even more people than last year, was consistent with results from the most recent survey from the University of Hong Kong's Public Opinion Programme. One year into Mr Leung's administration, the survey showed his popularity rating at an all-time low. Anson Chan, a former head of the city's civil service, has been scathing in her criticism of the chief executive. "He needs to demonstrate he has the essential ingredients of a good leader: political legitimacy, competence, clear evidence that he shares our core values and empathy with the community, especially those who are less well off. So far, he has not demonstrated he meets any of these criteria," she said. In order for Mr Leung to redeem himself, the administration must introduce a blueprint that will allow all eligible voters to select their next chief executive in a free and fair process by 2017, according to Mrs Chan. Earlier this week, the chief executive promised to start the public consultation process at "an appropriate juncture", but did not specify a time. Mrs Chan, who heads a new group called Hong Kong 2020 that fights for democratic reforms, said she was concerned that time was running out and that residents would find their suffrage hopes dashed yet again. She pointed out that public consultations which eventually paved the way for Legislative Council elections in 2012 actually started five years earlier in 2007. What she and other pro-democracy activists do not want to see is a rushed, shoddy proposal for democratic reforms that would be rejected by the public. When Hong Kong returned to Chinese rule in 1997, residents were promised a high degree of autonomy and, eventually, the right to directly elect their own chief executive and lawmakers. The opposition to Mr Leung has become so strong that a group of hunger strikers have set up tents in a corner of Chater Garden in the Central business district. Calling themselves the Anti CY Alliance, nine people were striking in 50-hour shifts early this week, before handing over to a fresh group of volunteers. The goal, they said, was to continue until the chief executive resigned. Some of the strikers were affiliated with political groups, but one of them, Dicallan Wong, was a 51-year-old scuba diving enthusiast who works in the tobacco industry. Mr Wong, who said he was generally apolitical, took four days off work to join the hunger strike because he was fed up with what he called Beijing's interference in Hong Kong affairs. "I have a problem with the whole system," he said, as fellow strikers took their blood pressure with portable machines. "CY is just a cog in the wheel. He doesn't represent the people. He doesn't consider our interests. I think he acts in the interest of the central government." Mr Leung was in fact not the Chinese government's first choice to become chief executive. The early frontrunner was Henry Tang, a previous financial secretary who was perceived to have the backing of former Chinese President Jiang Zemin. But the revelation that Mr Tang's home sat atop an enormous illegal basement, dubbed an underground palace, derailed his campaign. Running on a populist platform, Mr Leung won Beijing's backing. During his year in power, the chief executive has been credited with stopping pregnant mainland women from easily crossing the border to give birth in Hong Kong. Stopping the flow of so-called birth tourism is seen as his biggest success. Mr Leung has also promised to boost the supply of property and increase the amount of housing available to low-income residents. But no matter how successfully he delivers on bread and butter issues, critics like Mr Wong believe the chief executive has no legitimacy because of the way he was chosen. And due to Mr Leung's long association with the Chinese government, helping officials there formulate land policy, there are persistent rumours that he is actually a Communist Party member. He has consistently denied those reports, but his denials sound hollow to Mr Tam, the Hong Kong Academy of Performing Arts graduate. "Actually I have no personal hatred of CY Leung," he said. 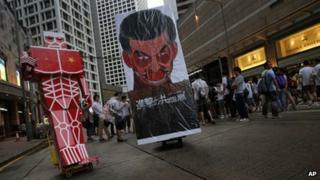 "CY Leung is just a Communist puppet. What we have to do is to oppose Communist tyranny."